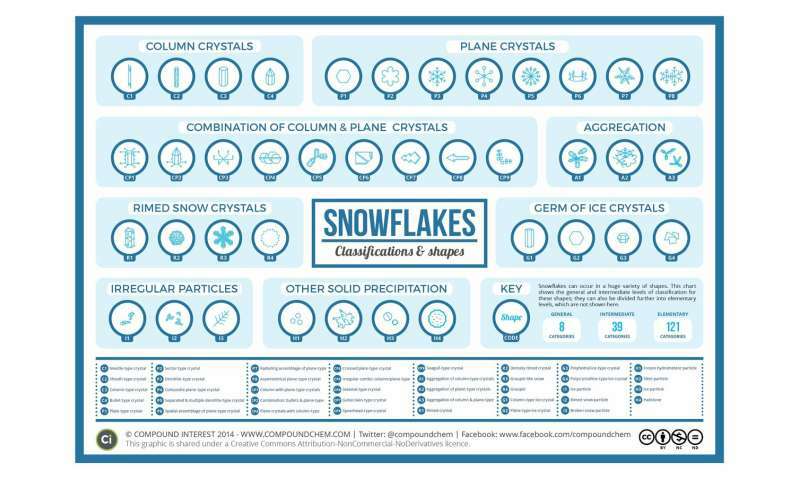 You may have heard that no two snowflakes are alike, and that's true, but they're not particularly different from each other on a molecular level, said Moneesh Upmanyu, a mechanical and industrial engineering professor at Northeastern. "Temperature controls how fast water molecules attach to the snowflake," he said. "Humidity controls how many water molecules saturating the air are available over the course of its growth." As they fall from the sky and accumulate water molecules, the spherical ice crystals grow dendrites, which look like branches on a tree. Ice crystals naturally form spheres, but sprout tiny needles outwards, because it's the most efficient way to diffuse heat. "If there's low humidity, you'll mostly like see a foot shape," Upmanyu said. "But if there's low temperature, you'll see something similar to a hexagonal prism." "Even in a controlled environment, you might only be able to see two different forms," Upmanyu said. "But in a snowstorm, where so much is happening, you'd only see clusters of snowflakes clumped together." So while you probably won't be able to tell a column crystal from a planar crystal with your naked eye, you can still form snowflakes into snowballs to toss at your friends while you're snowed in.